14 The Voice took on flesh and became human and chose to live alongside us. We have seen Him, enveloped in undeniable splendor—the one true Son of the Father—evidenced in the perfect balance of grace and truth. 15 John the Baptist testified about Him and shouted, “This is the one I’ve been telling you is coming. He is much greater than I am because He existed long before me.” 16 Through this man we all receive gifts of grace beyond our imagination. 17 You see, Moses gave usrules to live by, but Jesus the Anointed offered us gifts of grace and truth. 18 God, unseen until now, is revealed in the Voice, God’s only Son, straight from the Father’s heart. This Gospel begins not with Jesus’ birth or John’s baptism but with a deliberate echo of the creation story in Genesis. It takes us back before time began to the moment when God interrupts the silence and speaks the cosmos into existence. Only John’s Gospel names Jesus as the Logos and declares that He existed long before time was measured. This Greek word carries a variety of meanings, all relating to the act of speaking. It could be translated “word,” a thought that comes to expression, message, declaration, reason, or the content of preaching; most are found in various translations. It is clear that John means that logos is declared to all creation. John’s use of logos is unique and has often been rendered as “Word.” While this is a useful translation, even a casual understanding demonstrates that “Word” reflects only part of its meaning. Most readers will interpret “word” as a unit of language—a combination of sounds generally spoken but also written—that carries meaning. To understand what John means, readers need something more than their cultural understanding of “word”; they need a new way of thinking about it. This is why we have chosen to offer another rendering, an interpretive, poetic translation, of what may be one of the most theologically loaded words in Scripture. Since logos essentially refers to the act of speaking or bringing thoughts to expression, we have decided to use the word “voice” to capture that reality. John declares that truth has culminated in the person of Jesus. No single word captures the complete meaning of logos, but “voice” has a number of advantages. First, “voice” manifests the act of speaking. Voice is that which is spoken and that which is heard; it comes on both sides of any communication event, bridging the gap between sender and receiver. 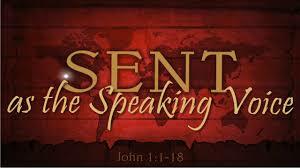 John intends that in Jesus God is speaking and revealing Himself to the world. Second, a voice is distinct and personal. We can distinguish people from one another simply by their voices. In John 10 Jesus describes the fact that the sheep hear the voice of the shepherd when he calls and they follow, but they refuse to follow a stranger because they do not know his voice (John 10:1-5). John desires that we know Jesus as the Son of God and believe in Him personally as the Good Shepherd. Third, “voice” is dynamic in that it reflects the robust and powerful activity of a living God. It is historical in that any act of speaking comes to expression and takes place in the real world as a “voice” calling, demanding a response. It challenges any notion that the Christian faith can be reduced to rules, propositions, or doctrines that can be merely believed or dismissed and not lived out in our lives. Since in Jesus God is speaking and revealing Himself to the world, and since in Jesus we hear the Voice of God, then this new reality changes everything so we, too, must change.